Ken and I are REALLY new to blogging but decided this would be a good way to share our adventures with family and friends. I apologize in advance for any hiccups in our early attempts at publishing here! I did a little research on how to do something like this and decided based on reading various reviews and options that 'blogger.com', which is a free site, might not be the sexiest blog site going, but it gives a good way to start sharing photos and journals without cost. This week when the first pictures of our new motorhome arrived, it became apparent that I have to find something better than emailing 5meg files of photos. 'Frerx Adventures’ shouldn’t be too hard for folks to remember. The Frerx is a common way we abbreviate our name. Now the ‘adventure’, for the very practical, comes from the fact that most of what we plan to discuss on this site will be about our RV adventures. However, if you are keen on the more philosophical approach then it has to do with how we choose to live our lives. We are at a time in our lives where our goals can be pretty much summed up in one word --- 'Adventure'!! The boys remember this as our family cheer that we stole from the cartoon, ‘Fluppy Dogs’ --- ‘Adventure’!! Ken and I have had a wonderful 25 years together, and have shared, during those years, dreams of how we envisioned this 'empty nest' phase of our life. We both believe that to live your dreams, it's a matter of 'thought, word, and action'. We've been lucky enough over the years to be able to share our thoughts in a way that allowed us to turn them in to a shared vision and then make the choices and take the actions to make that vision reality. It's the 'Power of Attraction' concept that's so popular now. We just never realized it had a name until we started with Unity http://www.unityworldhq.org/ several years ago. It wasn't earth shaking 50 years ago when Norman Vincent Peale was preaching 'the power of positive thinking', but let Oprah have a few shows on 'The Secret', http://thesecret.tv/behind-the-secret.html and suddenly its a global phenomenon. Things just seem to be falling in to place. 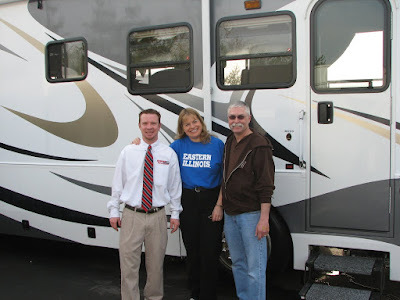 I happened upon a website http://www.rv-dreams.com/ and found myself addicted to following the adventures of Howard and Linda, a 40-something professional couple, who ditched the rat race, sold everything and hit the road in a 5th wheeler. Ken and I talked about Rving someday after the boys were gone but had never really got serious about it as a joint dream. 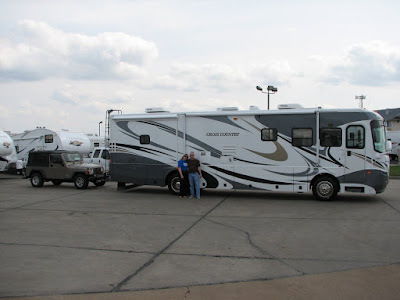 It was when Howard and Linda mentioned that they would be speakers at a ‘Life on Wheels’ seminar in Des Moines that things started coming together. The seminar happened to fall at a perfect time for us between work and football activities and so we decided to use some of my vacation to go to RV school. Anyone considering Rving for the first time should spend the time and money for these schools http://www.lifeonwheels.com/ , not only because of the wealth of information crammed in to a few short days but because it’s a wonderful introduction to the truly wonderful kind of people living this lifestyle. From then on, weekends that weren’t at football games or family activities were devoted to the hunt for our first RV. While the 5th wheel was our early choice, it soon became apparent with Trev moving to Eastern Illinois University that we wanted something more appropriate for 3 more years of tailgating as well. 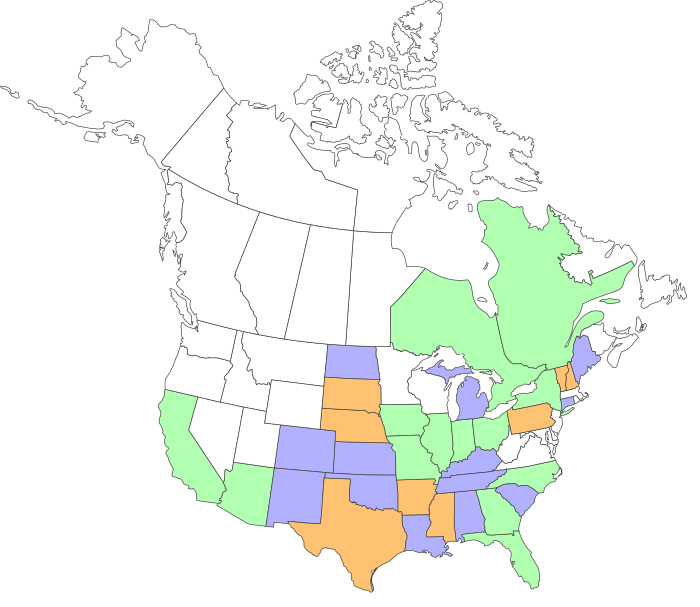 Our search took us to dealerships in 5 states. There was a tremendous difference in quality of coach and dealer approach. It was in January, that I realized that I had begun comparing everything we were looking at back to the Coachmen Cross Country 382DS and yet I just didn’t want to work with the dealership where we saw it. About a week after Ken was on the phone with his favorite dealer, Eric Jenkins at Howards RV in St. Louis when he was told they just placed a 382DS on order. Next thing, we are calling factory for some minor mods to the order and low and behold, we became the owners of a brand new motorhome on Friday March 23rd. 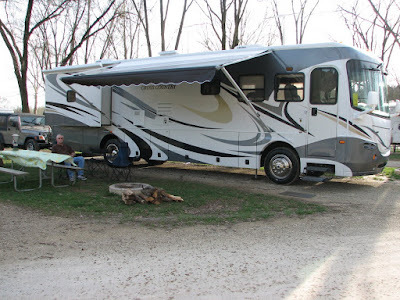 We spent the first night on the lot at Howard’s in St. Louis since as rookie Rvers we wanted to make sure we understood all our equipment and were sure it was working before we headed out. We found only the most minor of items for fixing, mostly cosmetic. In fact, my biggest frustration was trying to find a good place to put the trash can . After all the horror stories of how much would need adjustment and attention after the pre-delivery inspection, we were very pleasantly surprised. Howard RV did an excellent job of having the motorhome ready and all the bugs fixed before we got there. Although stressful (spending that kind of money) the entire purchasing process was smooth without pressure and overall pleasant. Our questions were answered and things were explained in ways that even newbes could understand. It really hit home just how big this thing was when we saw how small we looked beside it! 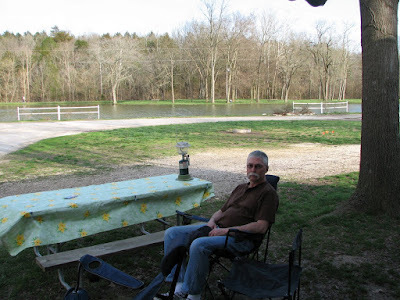 With our new jeep in tow, we headed out on March 24th to spend our second night in the motorhome at a real RV park, http://www.pinoakcreekrvresort.com/. Our night at the park was paid by Howard RV with one of the many campground coupons they gave us. The manager here was extremely helpful in getting us a spot that allowed for easy parking without need to back up or even unhook the jeep. It felt good after a two full days to scouring the RV and trying to understand all the new operational procedures to just kick back for awhile. They gave us a site right by the lake. Eric and his girlfriend, Kim, came over for dinner. Considering we’d never cooked out of this rig before they were quite brave. Ken’s salmon was rather dry since he was still struggling with how to regulate the LP from the RV into our gas grill. I burned the rice, not use to the LP stove (or was it that I was enjoying the wine Eric and Kim brought too much to pay attention!). But sitting around the campfire and talking to these new friends was great fun and after calling it a night Ken and slept really well in our new home on wheels. We had an uneventful 3 hour drive home on Sunday. Stay tuned for more ‘Frerx adventures’ in the weeks to come!